LDES served as the prime engineering consulting firm leading a multi-disciplinary team for the development of the Haxton Way Pedestrian & Bicycle Trail Safety Project (currently known as Red River Pedestrian Path), a project co-managed by the Lummi Nation and Whatcom County Public Works Department. The purpose of the project is to alleviate pedestrian and bicycle safety concerns along Haxton Way by developing an approximately 2-mile-long multi-use trail from Slater Road to Kwina Road. 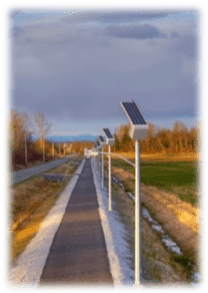 The project involved construction of a two-mile, multi-purpose trail system consisting of a paved trail, porous pavement, elevated boardwalks, new pedestrian bridges over Red River and the Lummi Slough, intersection improvements, and solar LED trail lighting. LDES was engaged in the ROW acquisition phase, and working with the Lummi Nation and Whatcom County staff. Design included stormwater drainage improvements as well as coordination regarding wetland issues associated with the 4 acres of wetland fill required to complete this project. In cooperation with the Lummi Nation, Whatcom County, FHWA and WSDOT, Army Corps of Engineers, WSDOE and BIA, our firm acted as the prime consultant for the American Recovery and Reinvestment Act (ARRA) and the Washington State Pedestrian and Bicycle Safety Program. The additional impervious pavement created by the construction of the two-mile paved pathway required installation of additional stormwater treatment. The roadside ditches could not be eliminated in most locations; therefore, bioswales were chosen for use in this project. The project included a 50-foot bridge and a 90-foot bridge. Cost of structure came in at 35% below third-party independent construction estimated expectation. In 2011, this project was bestowed an Award of Excellence under the Best Special Project Category by the Washington State Department of Transportation and the Federal Highways Administration. As stated in a WSDOT 2011 press release, “[This] transportation project achieved excellence in safety enhancements, construction, innovative design, environmental sustainability and community involvement…” (WSDOT Press Release dated 9/1/11). GeoTest provided all the geotechnical engineering for all the Helical Pile foundations supporting the boardwalk, the piles supporting the pedestrian bridges, and the luminaries. LDES also supplied quality assurance testing and supervision. Our geotechnical engineers provided subsurface soil and ground water explorations in order to render recommendations regarding stripping depth averages, suitable bearing conditions, material reuse, foundation design, drainage design and sub grade improvements. All of our special inspection services were in accordance with WSDOT criteria.